The digitalization of music has shifted much of the power base in the industry away from record labels to promoters, with booking agents acting as middlemen between the two. Though booking agents are able to demand excessive fees for their artists, promoters are ultimately in the most advantageous position as the main agents in choosing desirable venues and the equally crucial ticket prices. 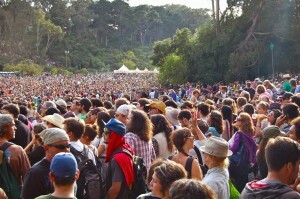 Hardly Strictly simplified these interactions as artists position themselves in front of a diverse audience that had been brought to the Golden Gate Park by the outstanding value of the event. Unexpected artists such as Hugh Laurie took the stage (see intro) while Gillian Welch presented a more traditionally “folk” flavor. Numerous other artists graced the meadows, creating a spectacle that was defined more by its rich musical heritage than any brandable event. As tech giants in Silicon Valley attempt to capture the social force of music and promoters work out the tides and swells of global audiences, free live events just may be able to assume a unique role in the industry. Their ability to bring together communities in mass-attendance events is now tested, in the most affordable way. Indeed, San Francisco has a habit of creating Aquarian turmoil. Beautifully done! Loved the festival and all it had to offer! hardly strict on anything, best free fest in the west!